In my last post, I discussed a particular video which I found to be more than a bit misleading. The discussion centered around a simple, but extremely counterintuitive notion of mathematics: the fact that the number 0.999…, or zero-point-nine-repeating, is equal to 1. Well, as I mentioned, the very counterintuitive nature of the result led at least one of my readers to question its validity. As such, I thought I would lay out one proof of this concept, in order to make it easier for those who do not accept the result to pinpoint exactly where they disagree. I’ll break my proof down into numbered steps, to ease in that venture. I’ve discussed before how mathematics can sometimes lead to very counterintuitive results. One of the most common, and famous, of these counterintuitive properties of math is that the number 0.999… (that is, zero point nine, nine, nine, repeating) is equal to 1. This one is so well known that it is fairly often taught even to Elementary and High School students. If you are unfamiliar with this discussion, I highly recommend that you watch this video from Vi Hart, in which she discusses 10 different reasons to accept this concept. Additionally, you may have fun watching this video, in which she lampoons the common objections to the concept. Despite the fact that it is fairly simple to prove that 0.999…=1, the concept is so counterintuitive that I find people try to struggle against it– even when they know and accept the reasoning behind the equality. One such attempt comes from Presh Talwalkar. In the following video, Mr. Talwalkar attempts to demonstrate that on the Surreal number system, 0.999…≠1. Unfortunately for Mr. Talwalkar, he is wrong. Even on the Surreals, it is still true that 0.999…=1. In my previous article, we began to take aim at William Lane Craig’s misconceptions regarding the nature of infinity. We continue on that theme, today, by taking a look at the further arguments which Dr. Craig makes in Part 10 of his Excursus on Natural Theology. While most of the objections which Dr. Craig espouses in this episode fall prey to the same mistakes which he was making last time, I still thought it might be instructive to respond to each one, in turn. Suffice to say, the arguments which Dr. Craig levies this time around are absolutely no better than the ones which he raised previously. In fact, I’d argue that– for the most part– they are far worse. One of the topics which William Lane Craig often discusses is a question which has been argued in the Philosophy of Mathematics for at least 2300 years. Can an infinite number of things actually exist? Dr. Craig asserts that such actual infinites cannot exist. This is actually a topic which I have discussed before, on this blog, but Dr. Craig attempts to tackle the question quite differently than does Dr. Wildberger. Interestingly, Dr. Wildberger is a mathematician, and most of my objections to his argument pointed out his unfamiliarity with philosophy; while Dr. Craig, on the other hand, is a philosopher, and most of my objections to his argument will point out his unfamiliarity with mathematics. Dr. Craig has discussed the topic of actual infinities in a number of different places, but I will be referring to his Excursus on Natural Theology, Part 9, for our discussion today. These are the same arguments which I have generally seen Dr. Craig present in his other work, but this happens to be the most recent exploration of the topic from WLC which is available to us. Unfortunately, just as he has done many times before (see here and here, for example), William Lane Craig demonstrates that he has a rather poor grasp of the mathematics he’s attempting to discuss. Whenever you add a finite integer to another finite integer, you always get a sum which is, itself, a finite integer. This, by itself, is not very shocking. When you add 1 to 1, you get 2. When you add 5 and -9, you get -4. When you add 0 and 299,792,458, you get 299,792,458. This is all rather unsurprising. However, math can get weird once you start adding up an infinite collection of numbers. Take Zeno’s Dichotomy Paradox, for example. Numerically, we can represent this problem as an infinite summation: Even though we are adding up an infinite quantity of numbers, we arrive at a finite value– in this case, . Arguably the most famous philosopher in history, Aristotle, would have vehemently objected to this formulation– and, in fact, did object rather loudly in his book Physics, when discussing this particular paradox. However, it has been over three centuries, now, since mathematicians would have found this problem to be controversial; and, in fact, similar cases of infinite summation form the entire basis of integral calculus. High schoolers are introduced to these concepts in their Pre-Calculus classes, nowadays, and you might even remember evaluating some of these limits of convergent sums from your own schoolwork. But math can get far stranger, still. One of the most peculiar things in all mathematics occurs when you attempt to sum all of the Natural numbers. As absolutely insane as this might sound, today I’m going to demonstrate for you that . Words can be tricky things. The same word can often carry wholly different meanings depending upon the context in which it is used. Take, for instance, the semantic range of the word “light.” This word can carry very different meanings when used in different contexts, as the following sentences illustrate. That shade of pink is light. …my logic would be invalid, because the definitions of “light” used in (1) and (2) are completely different. Mathematics, unfortunately, contains some terminology which tends to lead to these same sorts of equivocation fallacies, because the common usage of a word very often differs from the mathematical usage of that word. While there are numerous examples from which I could likely choose, today I’m going to focus on a case which I believe to be particularly egregious. Today, I’m going to discuss Real and Imaginary numbers. There is an inherent danger attached to blindly accepting the word of someone who sounds like they are presenting a rational, scientific claim. Too many people are willing to accept a proposition solely because they’ve heard it from someone who bears the appearance of intelligence. The line of thought seems to be, “Well, he’s smarter than me, so he must be right!” Unfortunately, this sort of fallacious reasoning goes largely unchecked, and often becomes formative in the common understanding of entire groups of people. For almost the entirety of your mathematical education, you have been taught that the ratio of a circle’s circumference to its diameter, which we affectionately refer to as π, is something close to , or about 3.14; however, today I’m going to show you that your math teachers were wrong. In actuality, the value of π is exactly 2√3, or about 3.46. In right-angled triangles, the square on the side subtending the right-angle is equal to the (sum of the) squares on the sides containing the right-angle. The Pythagorean Theorem is my favorite math problem of all time. I feel so strongly about this particular bit of geometry that I have the theorem tattooed on my chest. Over my heart. In the original Greek. Yeah, I’m that kind of nerd. Most people have some vague recollection from their high school math classes that the Pythagorean Theorem is ; and a few even remember that the c in that equation refers to the hypotenuse of a right triangle, while the a and b refer to the other two legs. However, most of the time, people were just taught to memorize this theorem– they weren’t taught how to prove that it was actually true. Now, the Internet is full of all kinds of really clever visual proofs involving rearranging copies of the triangle in order to form the different squares, but I’m not really a huge fan of these. They make it very easy to see that the Pythagorean Theorem is true, but they don’t really make it easy to see why the Pythagorean Theorem is true. 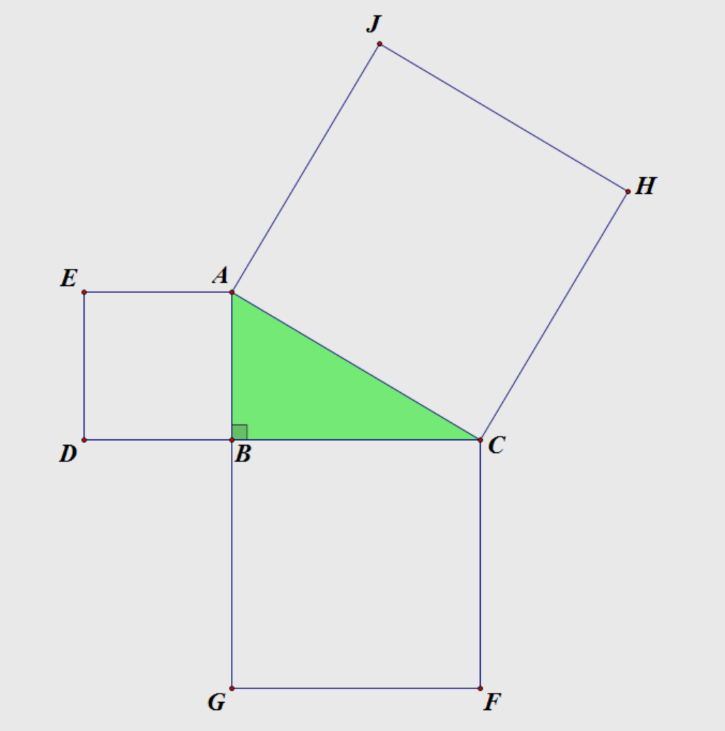 So, today, I wanted to discuss my favorite proof for the Pythagorean Theorem, which comes to us by way of Euclid’s Elements, which was the standard textbook for math in the West for around 2000 years. Εἰ δ’ ἐστὶ συνεχὲς καὶ ἁπτόμενον καὶ ἐφεξῆς, ὡς διώρισται πρότερον, συνεχῆ μὲν ὧν τὰ ἔσχατα ἕν, ἁπτόμενα δ’ ὧν ἅμα, ἐφεξῆς δ’ ὧν μηδὲν μεταξὺ συγγενές, ἀδύνατον ἐξ ἀδιαιρέτων εἶναί τι συνεχές, οἷον γραμμὴν ἐκ στιγμῶν, εἴπερ ἡ γραμμὴ μὲν συνεχές, ἡ στιγμὴ δὲ ἀδιαίρετον. Οὔτε γὰρ ἓν τὰ ἔσχατα τῶν στιγμῶν (οὐ γάρ ἐστι τὸ μὲν ἔσχατον τὸ δ’ ἄλλο τι μόριον τοῦ ἀδιαιρέτου), οὔθ’ ἅμα τὰ ἔσχατα (οὐ γάρ ἐστιν ἔσχατον τοῦ ἀμεροῦς οὐδέν· ἕτερον γὰρ τὸ ἔσχατον καὶ οὗ ἔσχατον). There is a concept which is absolutely intrinsic to all of geometry and mathematics. This particular concept is utilized by every single High School student that has ever graphed a line, and yet this concept is so incredibly difficult to understand that most people cannot wrap their heads around it. I’m talking about the concept of the continuum. Basically, the idea is that geometric geometrical objects are composed of a continuous group of indivisibles, objects which literally have no size, but which cannot be considered “nothing.” Despite the fact that these individual objects have no size, they form together into groups which, as a whole, can be measured in length or height or breadth. In mathematics, objects such as lines, planes, volumes, and all other sorts of space are considered to be continua, continuous and contiguous collections of these indivisibles into a unified whole. Because these infinitesimals have no size, themselves, even finite spaces contain an infinite number of these points. Nearly every mathematician on the planet subscribes to this point of view. However, this was not always the case. Only a little more than 100 years ago, this view was considered extremely controversial and was only held by a fringe minority of scholars. Four centuries before that, this concept was nearly unthinkable. Though it has become, without question, the prevailing view of mathematicians, even today there remain a tiny handful of scholars who object to the use of the infinitesimal, the infinite, the individible, and the continuum in modern math. One such person is Dr. Norman Wildberger, an educator and mathematician for whom I have the utmost respect. Still, I disagree with Dr. Wildberger’s philosophy on this particular issue.